Tinisha Dolaira is the female lead of my series and love interest of Patrick Donovan. When I created her, I based aspects of her personality on my late grandmother, which include a compassionate heart, a sharp mind, and strong moral code. In addition, I made Tinisha the same age as my grandmother when she passed away. In terms of species, I made Tinisha one of my favorite of all mythological beings, a high elf. However, to avoid cliches from other sword and sorcery stories, I placed Tinisha outside of her comfort zone when she is transported from her home world into twenty-first century Earth. She is very afraid and curious about how the modern world works and often turns to Patrick Donovan for comfort and explanations. While she is inexperienced about the modern world, she is morally wise and has strong ideals. Due to her advanced age, Tinisha serves as the big sister or motherly figure of the team. Because of the nature of their first encounter, Tinisha feels like watching over Patrick and his friends to be her responsibility. Written by Christopher Paolini, I did not know what to expect when I first read Eragon, but when I did, I was in for a surprise. This story is an elegant blend between Star Wars and The Lord of the Rings, two of my favorite story franchises. I also enjoyed how the author described the mythological creatures that are depicted in the story, specifically the dragons and elves, which are two of my favorite fantasy beings. Eragon allowed me to see the spiritual side of dragons, making them appear more human and less like animals. When the author described the elves, it was like he was trying to illustrate the appearance of angels without wings. I would recommend this story to anyone who enjoys sword and sorcery. When I designed one of the main characters of my series, Patrick Donovan, I based him on the positive aspects of my personality. In addition, I gave him the powers that I would want to have if I was a superhero, which included fire-based powers. Also, he has insecurities and doubts about his potential as a superhero. He is haunted by the murder of his younger sister, which gives him a strong dislike of all that is evil. Patrick starts out as an average teenager who is a social outcast and trying to live a normal life. However, when he becomes superhuman, Patrick has a psychological struggle with his own power, which is linked with his anger and hatred. He does not feel comfortable with the idea that he is considered the team leader, but nevertheless, is eager to join his teammates in their crusade against evil. One of my favorite superpowers has always been pyrokinesis or fire manipulation because of the powerful ferocity it can give the user. 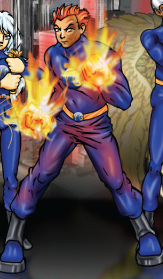 When I was designing one of the main characters of The Young Guardians Saga, Patrick Donovan, I wanted to give him a power that stood apart from ordinary fire manipulation. To that end, I turned my attention to my favorite of all mythological beasts: dragons. I wish to give Patrick features of a dragon while maintaining his human form, so I decided to give him the ability to generate and control the very flames that dragons breathe. Apart from wielding dragon fire, I wanted this power to have a psychological effect on Patrick whenever he uses it to the extreme, which would result in giving Patrick the ferocious mindset of a dragon. Stan Lee has been widely acknowledged as the founding father of the modern superhero genre as well as the co-creator of many of the superheroes that we all know, such as Spider-Man, The Incredible Hulk, The Fantastic Four, and so forth. In addition, he has made a cameo appearance in every single film Marvel Studios ever created. For anyone who wishes to learn more about this comic book legend, click here. Written by Brian K. Vaughan, this amazing graphic novel tells the story of a group of children who discover their parents are secretly an organization of super villains called The Pride. Complete with a unique origin story and a fast-paced plot, the Runaways keeps the reader wondering what will happen next as these children attempt to save the very world their parents are trying to destroy. In addition, the powers and equipment that the children acquire to combat their parents’ evil are very intriguing with a deep sense of variety. When the writer created The Pride, it was enjoyable to see that he based them on all the various archetypes of super villains: crime lords, dark sorcerers, mad scientists, time travelers, alien invaders, and mutants. This story is highly recommended to anyone who would enjoy the superhero genre. Goals: Seek revenge against Patrick Donovan and kill anyone or anything that gets in his way. Powers and Abilities: Cybernetic body equipped with superhuman strength, durability, reflexes, flight, and advanced weaponry. Vulnerabilities: If his brain is damaged or destroyed, he will die. In addition, the experimental technology that keeps him alive also drives him insane.